I've noticed more and more people seem to have tattoos these days, and although I've had mine for more than 16 years, I might be thinking about getting another one. Whether I do or not, I always enjoy looking at other tattoos and of course pondering the stories behind them. Isaac Fitzgerald is the editor at BuzzFeed Books and has put together a book of tattoos from people from all walks of life and the personal stories behind each one. Illustrated by Wendy MacNaughton, the result is Pen & Ink: Tattoos & The Stories Behind Them. I'll admit it was unusual to read a book about tattoos without colour photographs of the artwork, but I'll admit a certain pleasure seeing the drawings of the art instead; no trouble with poor lighting or distractions from the human canvases. Pen & Ink: Tattoos & The Stories Behind Them would make a great Christmas gift. 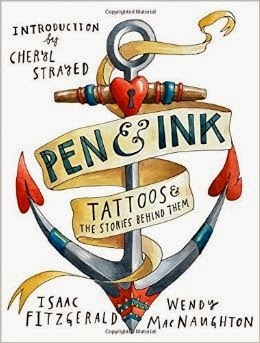 Pen & Ink: Tattoos & The Stories Behind Them by Isaac Fitzgerald and Wendy MacNaughton is available from 1 November 2014, RRP $29.99, click here to buy it now.